After the publication of the Hurricane, the main question that came up was why the zero degree turning radius wasn't shown in action. The short and simple reason is because the model is not able to. Probably a big disappointment for many, and some might directly conclude that it is then a poor model design. Could I have made it work? Probably so as 'Coney' has already proven with his Hurricane. Would it have been technically as interesting? Certainly not! Sometimes with designing models the limitations of the LEGO building system become painfully obvious and this was certainly the case with this model. Several times I just wanted to cancel the project, as it didn't live up to my own standards and expectations, but decided to continue and see how far the jeep would get and explore the boundaries of what was possible. So what was the development process like? 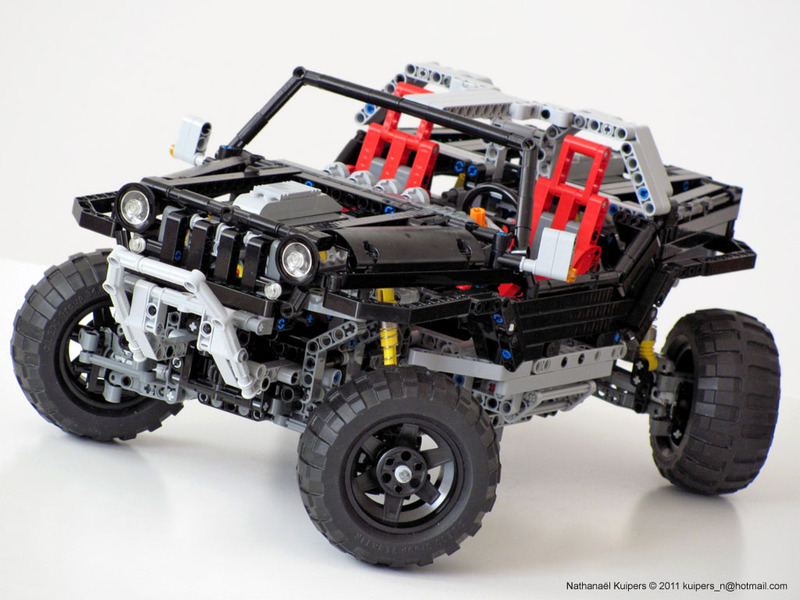 Because the real Jeep Hurricane is a technical marvel, I wanted to design the LEGO version in a similar spirit. Of course the zero degree turning option with skid steer had to be integrated somehow as this is the unique feature and characteristic of the real vehicle. The challenge however was how to combine this with the 'standard' 4WD and 4WS. An option would have been to power the left and right drivetrain and steer each wheel independently, but because that was already done by 'Coney' I wanted to do something differently. The problem also with steering each wheel independently is that they easily end up misaligned, unless there are some electronics behind it like in the real Hurricane. So my first question and challenge was if it would be possible to solve the problem of the different wheel configurations mechanically in such a way that all the wheels are related and connected with one another in all positions, not forgetting that they also needed to be individually powered and suspended. For the standard steering mode, having the position of the left and right wheels connected with each other, the easiest was to use a gear rack. I also knew that by moving the whole gear rack away from the wheels, they turn inwards. This had to be achieved by a controlled sliding motion for which again gear racks were used in combination with a worm wheel. A linear actuator could have done the job here as well, but they would have been too big. Once there was a working prototype of one of the axles, I had to build another one, which was a great opportunity to see if things could be simplified and built more compact. The next challenge was to find a solution for switching from normal drive to skid steer drive, using only one input. 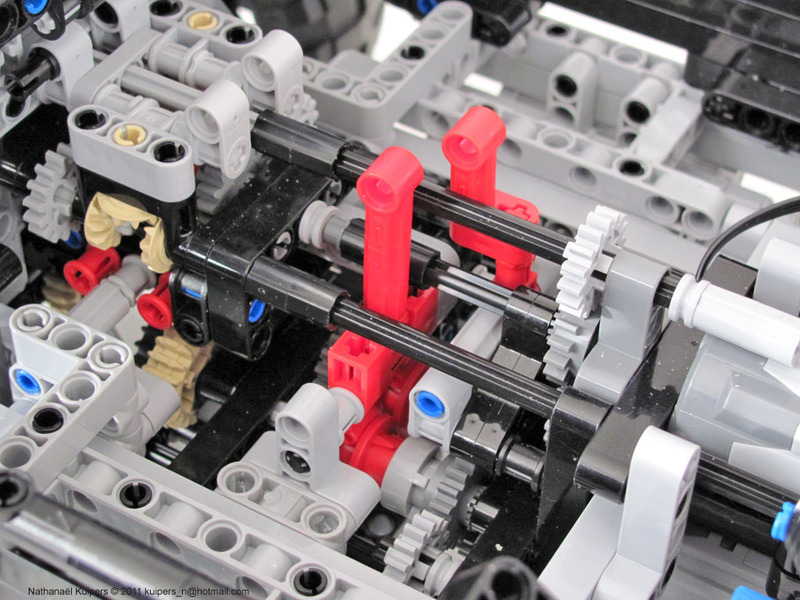 In any case it was necessary that the left and right drive train are separated, which should either work synchrone or in opposite directions. To achieve this the first idea was to be able to switch between odd and even number of gears in between the drive trains. Although there was a working concept it had certain drawbacks, one of which was the lack of a central differential which was not very realistic. So then the idea came up to use the differential itself as part of the switching function. Either power the central differential so both output axles go in the same direction, or power one of the axles as input and block the differential, so the output axle has to turn in the opposite direction. Because this meant that the smaller gears in the central differential play an important role and had to deal with some high stress I added another gear in the end to form a couple. So now I had two working concepts, one for the different steering modes and one for the different drive modes. The next step was to integrate both in a single chassis. It was important to keep the distance between the front and rear axle as short as possible so it had the best chance of working. Preferably the model should be able to carry some motors too, which meant that space was very limited. Therefore it took some redesigns before I had solved all the interference between the different moving parts. Unfortunately this also meant that one of the differentials had to move further back, giving one of the axles more leverage to twist. After the chassis with drivetrain was done, it was now time to connect the different steering configurations of the front and rear axle. The thought was again to use a switch for selecting a configuration and use a motor to put it in action. The central lever for switching the drive train in the chassis didn't leave much room for both a motor, and the switching function of the steering modes. Besides a possible misalignment, this lack of space was the final reason to leave out the crab steering mode. I still needed to reverse the direction of the input axles of the different steering modes somewhere in between the front and rear to make sure that the result was correct. On top of that the drivetrain had to be connected to, a couple of V8 piston engines in both front and rear, which meant a lot of other gears and axles had to go through the center of the car as well. Are there Building Instructions for this? It is great !! No, because what you see are 2x4 L-Shape liftarms, thus the part that's supposed to be problematic on your view, is in fact laying at a lower plane. I have to laugh at the people that have posted rude remarks at various sites from all over the world that NK's model was a FAILURE and that they would not build it because it did not actually drive. Seriously, who do these people think that they are and why am I not seeing their marvelous creations that are so wonderful? The fact that NK has to explain himself of why he built what he built and why he did it is comical. 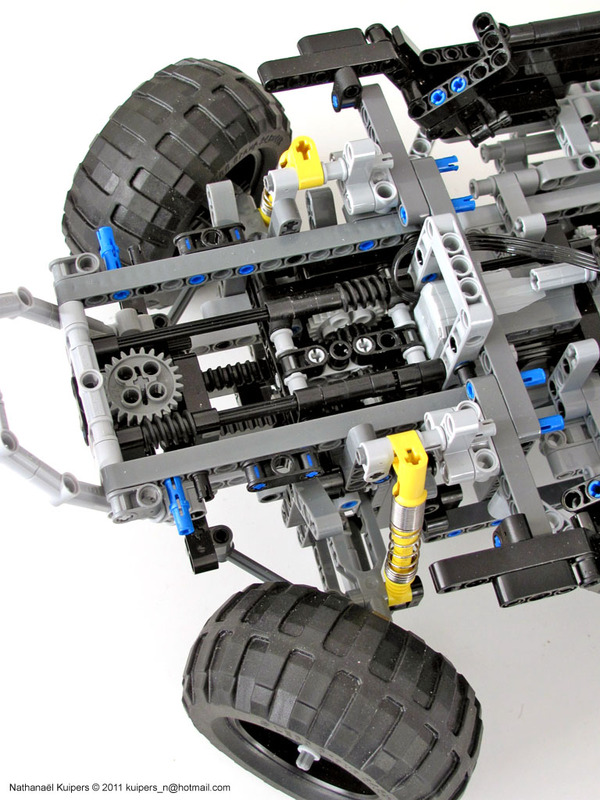 The jealousy that I have seen towards some of the best Lego technic builders is quite sad. Perhaps if these same people sat down and actually spent as much time building as they do nitpicking other people's amazing work, then they might actually have something worth sharing. Often people tend to forget that most official Technic sets are designed for manual play and do not aim any motorization at all. Motorization at some official sets, dos not work particularly well also. IMO, 8421 Mobile Crane is a good example of that. Sometimes, to motorise a model, the drivetrain has to be boring and over simplified, as is the case with the bulldozer from 2007. Now I have a conundrum. Do I build my own hurricane, or try something else that's innovative? Either way your hurricane is a high benchmark to beat. As is usually the way i'll build the hard part and not bother with the boring, non functional stuff like bodywork haha! Why didn't NK write on mocpages that the model cannot drive in zero-radius steering mode? If there are any rude comments about this model on the internet, I suspect it is because he (at first) kept it secret that this model cannot drive in zero-radius-steering mode, perhaps because of pride. There is nothing wrong with pointing out a blatant fact: this model cannot drive when in zero-radius mode. There is no need for NK to 'justify' this, because no one is judging. Whether or not this makes the model a 'failure' or 'bad' is entirely a matter of opinion, and a pointless topic of discussion! Why is it that almost ANY model made by either NK or Crowkillers causes a pathetic argument? Probably because of the fanboys (like Randy) who think these builders are in a 'league of their own' and claim that any criticism is a result of jealousy. Don't get me wrong, NK and Crowkillers are both good builders. While I agree that this is no place for an argument, I too have seen remarks made about Nathanael's model on some European forums that were really uncalled for. The guy is opening new windows of ideas with every model that he designs and I also feel that I also disagree with the "fanboys" comment. Paul and NK are probably 2 of the most influential, inspiring, and and copied technic builders out there. It seems everytime I check Ebay someone is selling off a copy of one of Paul's models for profit, and for as much as I hate to say it because I hate to think of my work as inferior(as most people would instinctively do) these guys are in a league of their own. "If there are any rude comments about this model on the internet, I suspect it is because he (at first) kept it secret that this model cannot drive in zero-radius-steering mode, perhaps because of pride." Where and how "Exactly" did Nathanael ever say that his model could "Drive" in the first place? And what "Exactly" did he keep secret? He didn't even post any videos of it driving in any mode mode and I don't recall seeing any IR receivers hooked up for remote controlling, so it seemed to me that most people just assumed that it was in fact able to drive without looking at the obvious facts that told otherwise. And his "Pride" kept him from telling the truth about this? Really? So you're basically saying that he knew he was debuting a model that he was being dishonest about? That is crazy talk. The problem with builders like NK and Paul is that they have the bar set so high that all people can do is nitpick whatever flaws they can find. A thread is made at eurobricks showing a mediocre model by some guy and it will have 20 response all praising it, even though most of the ideas have come from other builders. Then another thread is made showing one of NK's models and there are 10 responses and half of them are negative even though his model has shown people new ways to use their parts that they have never imagined. "these guys are in a league of their own" Err...I never actually disputed this. Even if this is true, it does not mean their models are beyond criticism. Criticism is also not necessarily a result of jealousy. I wish people could forget that a 'person' built each model, but instead judge the model itself. You (Erik and Randy) are fanboys, because you do not focus on the models themselves, but instead rant on about how 'good' it (or the builder) is without stating your reason. Just like AMD/Intel/Nvidea/Apple/Microsoft/Linux/Sony/Nintendo fanboys insist that the company they support is superior, and will become defensive at even the slightest criticism! Each model is just a model, it doesn't matter who built it. "Where and how "Exactly" did Nathanael ever say that his model could "Drive" in the first place? And what "Exactly" did he keep secret?" He never said it could, but he never said it couldn't, so it was unknown. I see you have not really read my comment, but instead just skimmed over to pick out text which can be interpreted as an insult. Your reply is typical of a fanboy. You assume everything is written to insult the thing which is your obsession, in this case, NK/Crowkillers. I do not intend to insult either, and this is the last thing I will write on the matter, because I do not want this discussion to continue. If the Hurricane would drive properly, I would also expect NK to have shown it in the video. Having not done that, I always admitted it won't drive, as I've discussed it with him. However now and after all this discussion, I became curious to see how far this model can really go. If you see the video from Contech's Hurricane version, it has also a noticeable difficulty to turn in zero-steering mode. Quite understandable if you realize the wheels do not lay tangent to a perfect circle. 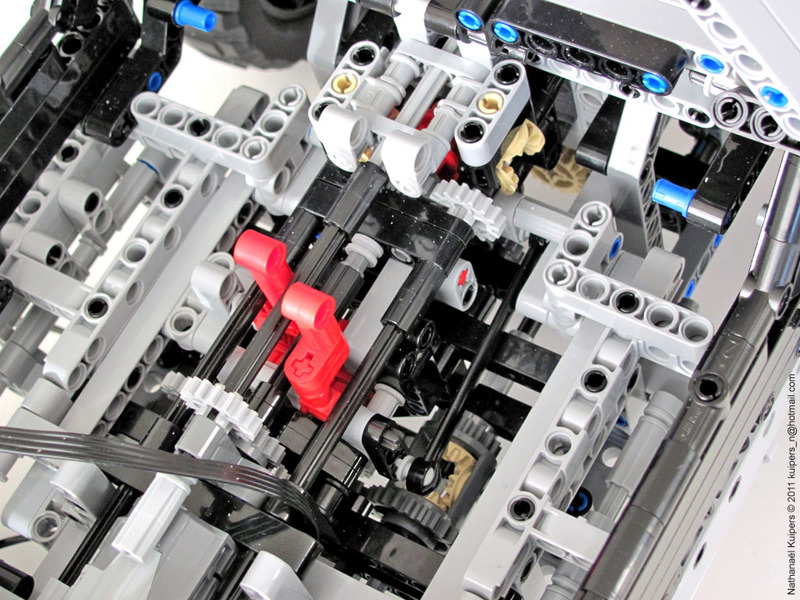 Thus there are a lot of friction forces running there, which we all should know, are fatal for LEGO Technic models. It is obvious to me, that Nathanaël and Paul are on their own league maybe with a few other Technic builders like Majhqa. Not to mention that NK was a LEGO Designer himself, if some proof was needed. Why should we have problems to give credit to who deserves it? Of course, from the best we always expect the best. And it has been always the best, hasn't it? I still do not understand why can't the model drive on its own. In the video you can clearly see the wheels turning automatically. Is it that the mechanism cannot transmit enough torque to the wheels to actually move the car? So because I can recognize what a really good model is or isn't, that makes me a "Fanboy"? I am talking NK's new piece for what it is, not what everyone else thinks it should be. There are really amazing things that he going on with it regardless if it actually drives or not. Is a single U-joint used at each wheel? If so, bevel gears could have been used at each wheel instead of U-joints, so the wheels can turn more than 45 degrees and align properly, and the vehicle would have a much better chance of turning. I think it is possible with Lego parts. I followed this since it was about, brickshelf here etc. This thing is very packed with alot techno wiz, but I never thought it was a TT truck etc. One thing that most, you think? would know that if you want a 4x4 that works off road, keep it simple, keep it light. This is/was a model to show how far one can go. I see no way anyone can say well since it cant do this or that its bunk? I myself have had ALOT of critics with my biped, to slow, its not dynamic!! (ITS freaking Lego not Asimo) Most of the worst was from Engadgets blogs. I never let it bother me, fact is most that complainers can not build anthing close or they would have and have the video to prove it. I think he could crack this and get it to zero turn. But it is lego and even when it can do this it may only work on flat even ground, even then "THey will complain, those thatcomplain always complain in every area of life. Great work here, nice blog, I always find insperation for oddities here. I completely agree with you. Everyone is so caught up in motorizing everything to drive that they are missing the main point of the incredible building techniques that are behind it. If motorized, a vehicle of this size and weight would creep so slowly that there literally would be no point in motorizing it in the first place. 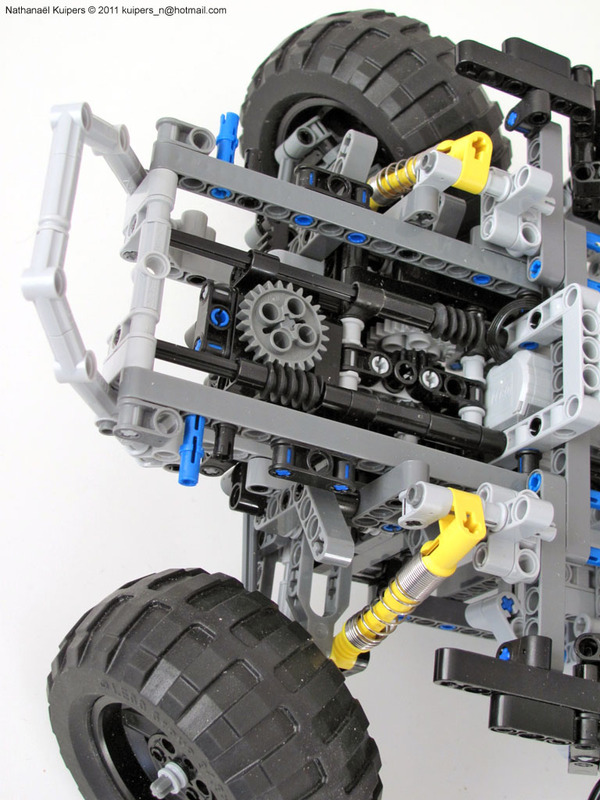 Legos are plastic and the plastic gears simply cannot handle the torque to move large vehicles at a moderate speed without the gears breaking or plastic axles twisting. Another thing about this wonderful masterpiece is that you can tell that everything is built properly and with some amazing creativeness behind it. Many people build flimsy mechanisms just to get by and call it what they want regardless of whether or not it actually works properly(or at all) This is not the case here as this model is built with a remarkable sense of engineering behind it, and I am sure 100's of hours. Put a flamethrower on it! I like the steering solutions the most; that's what makes this model special for me! so it doesn't work; so what? I bet 80% of what most people build fail, at least he has the balls to publish a "failed" project. "Boarf. Je suis assez déçu que nk n'ait intégré du pfs que pour le show. Pourquoi tout simplement ne pas avoir présenté l'engin dans sa configuration normale? Avait-il peur de décevoir"
"Boarf. I'm pretty disappointed that nk has integrated pfs only for the show. Why did he not simply presented the model in its normal configuration? Was he afraid to disappoint? I was stupid because I only wrote the negative part of my though and didn't hand out the rest : " what a marvelous and awesome model". I should have written : "This model is awesome but I find that..."
So my apologizes nathanaël, your model is amazing and keep my eyes open for a while. Sorry for my bad english, i hope this message is still understandable. This was a "Failed" project??? When I saw the model, I knew that it couldn't turn by itself, so what ? I like the design, the functionnality, ok it can't turn but it's not the point I think. I agree to most of people expect the best from the best builder. Also, why always motorized ? The aim of technic for me is the manual function. Nk's jeep is a hybrid. I am not a fanboy, just I disapointed with the comment like this. What if Paul, come and say that he tried to motorize one of the Lambos and it doesn't drive, because of weight for instance? Would it be also a Failed Project? Certainly not! Simply because no one thought about that before. I think this model should be thought of as an excellent MANUAL model that uses motors, not a failed trial truck :-). The models which drive BEST are normally very optimised to do so, and this can mean a very simplified drive-train. This model is not optimised in any way, so I would not expect it to drive well. Having said that, the one thing about TTs that can be MORE complex is the suspension. Granted, this model will never be a good TT (too complex), but it could easily at least drive if it used a better suspension, for example, gearing down right next to the wheel using a 36t bevel gear, and using 3 bevel gears instead of a U-joint. Using a better suspension would also allow the wheels to align when in zero radius mode. 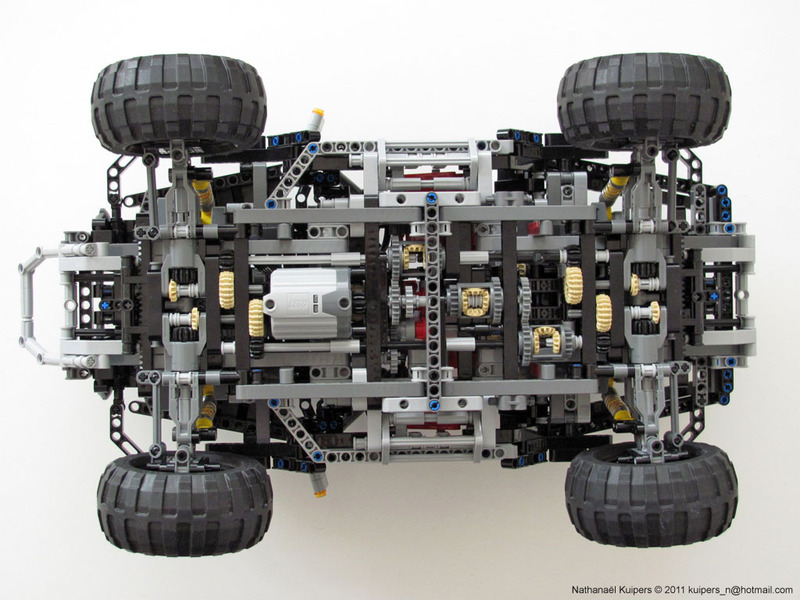 I disagree that this model is 'limited' by the lego building system, because the thing that limits it most (suspension) can be easily worked around. Look, guys. Once and for all, stop shooting this model down! While I agree with Daniel's statement that the most limiting factor in this model(the suspension)is easily worked around, I definitely don't agree with all the people who are plainly bypassing the pure awesomeness of this model and going straight to its shortcomings. When those who have condemned this model build their own Hurricane with the zero degree function, I'll respect them, but not before. NK, you're a genius. No matter what other people say, this model is a monument to what can be done with the Technic system. Thanks very much for posting and explaining pictures of this model. LEGO 6754 is the LEGO Creator Family Home and it is extremely popular at the moment amongst LEGO fans. This is not surprising if you consider the fact that you are getting a 3 in 1 LEGO house.